There are now 130 days between today and the 2017 NBA draft. So, now we’ve seen some stuff. March Madness is still a month away, but the lottery has taken shape, and this much-hyped draft indeed looks deep, all the way through the back end of the second round. We can, within reason, get excited now. That said, it’s still too early in the process for anyone to want to read a super-long intro. Just remember that the first rule of compiling a draft board is that nobody really knows anything: it’s about making the most educated guesses. After first and second-hand scouting over the years in addition to conversations with scouts and others around the league, these are the top 30 prospects—again, regardless of draft order or team fit—as SI sees them going into the NBA All-Star break. 6'4″, 195 | GUARD | FR. Despite a rather horrid team surrounding him, Fultz has a demonstrable hold on the top spot, possessing the best available combination of physical tools, playmaking savvy and scoring ability. He’s shooting an impressive 42% from deep on five attempts per game, though just 64% from the foul line—the latter of which can be indicative of some eventual regression from the field. 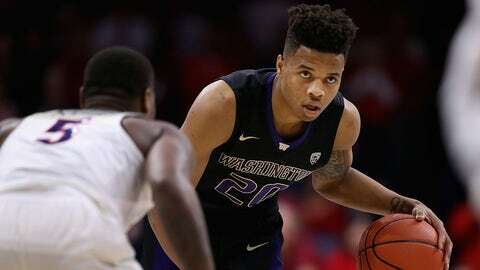 Fultz is so talented that he’s going to get nitpicked like that, and it can sometimes be hard to separate his own merits from a lackluster Huskies performance. He occasionally floats, and could be more assertive situationally, but having seen him in a few different environments over the years, I’m unconcerned. As it stands, I’d be pretty surprised if he’s not the No. 1 pick. 6'3″, 195 | FORWARD | FR. Take a close look at Smith, who’s looking fully recovered from last year’s ACL surgery, and you’ll see a prospect with as much long-term potential as any in this class. His burst to the rim and finishing ability, impressive passing chops (6.8 assists per game) and effective shooting displays (38% from three) suggest he can be someone’s long-term answer at the point. 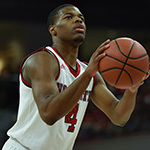 He and Fultz are similar in that their teams have struggled, and N.C. State has badly underachieved on whole, which is a matter of concern to some when looking at Smith—his stat lines can appear a little empty when all the talent around him can’t put it together. One scout I spoke with made an apt Steve Francis comparison. He’s a top five talent. 6'8″, 207 | FORWARD | fr. Jackson possesses obvious allure at the top of the draft, given his physical strength, slashing ability and dominance in the transition game. There’s safety in his skill set and production. He’s active on both ends and should be a plus perimeter defender. The biggest point of concern, as you’ve heard and will keep hearing, is his jumper: his three-point shooting has trended noticeably upward (15–26 over his last seven games), but the mechanics aren’t pretty and it doesn’t translate to the foul line (55%, not so great). The big risk is that the shooting struggles eventually hamstring his scoring ability. The fact he’s old for his class and often relies on bullying defenders raises another question. Nevertheless, he’s sitting pretty squarely as the top wing prospect in the class. 6'4″, 185 | GUARD | FR. 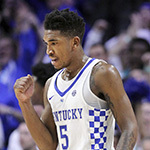 Monk has been perhaps the most exciting player in college basketball this season, a special scorer and athlete with the ability to make degree-of-difficulty shots look easy. His quickness and instincts will make him especially dangerous off the catch, and as Monk learns to create better separation off the dribble, his upside could be scary. Questions here are mostly tied to his size and positional fit—he’s probably closer to 6’2” than his listed height, and though he’s a good passer, he may not be best suited for full-time point guard duties. With that in mind, his team fit and backcourt partner will be especially key to his early success. 7'0″, 230 | center | fr. 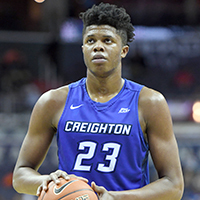 Justin Patton is the best prospect nobody really knew about going into this season. You should be fully aware of him now. The former four-star recruit redshirted last year and had a quiet college recruitment, Creighton’s coaching staff moving quickly to keep him home in Omaha. Patton’s taken the Big East by storm in his first season, and his size, fluidity and varied set of skills offer serious appeal in a draft devoid of surefire impact bigs. He’s a terrific passer, comfortable scorer around the rim, blocks shots and has become an increasingly comfortable jump shooter. There’s little question he belongs somewhere in this lottery. 6'11″, 205 | FORWARD | FR. 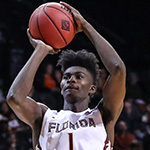 Isaac’s size, shooting and rebounding ability present an intriguing package and have made him indispensable for Florida State. He needs to get a lot stronger, but he’s an ideal combo forward with crazy length the tools to be a future starter for someone. His performance this season has affirmed that, and you can point to Brandon Ingram’s strengths last season as a baseline for his case in the high lottery. You’d like to see him be more aggressive at times, but his overall scoring efficiency on a guard-dominated team says a lot, too. 6'8″, 204 | Forward | fR. His freshman year hasn’t been the smoothest of rides, but there’s no doubt about Tatum’s scoring ability. One of the most polished offensive players in the class, he’s affirmed his strengths during an up-and-down Duke season, but hasn’t always meshed into the offense and has some ball-stopping tendencies that could hurt him as a pro. He checks a lot of boxes as a scorer but hasn’t fully shed his penchant for hunting shots, which has held back his efficiency somewhat and is something that will have to change as he adapts the next level. That type of play gets harder to justify as competition improves. It’s been intriguing watching him play more power forward for Duke, where he’s been able to use his quickness as mismatch. 6'6″, 190 | guard | fr. The ranking is probably not indicative of where Ball will be drafted—he looks bound for the top five one way or another—but illustrates some concerns about his ability to score at the next level. His ability to make the killer pass will obviously translate, and although his jumper is unorthodox, it’s repeatable and works for him. The big question is how many elite point guards are there in today’s NBA who can’t consistently create their own shot? Ball will be reliant on his change of pace and benefit from the bigger NBA court, but it’s unclear how he’ll find consistent ways to score in the half-court, whether driving to the rim or from mid-range. He’s a playmaker first and foremost, and you’ll note that UCLA’s potent offense has stalled from time to time as opponents find ways to bog the tempo down. If you’re investing in Ball with a high-pick, then it makes the most sense to fully commit to his preferred, fast-paced style and unique talent and just let him go. 6'4″, 171 | guard | fr. Fox’s lack of a demonstrably consistent jumper docks him points, but he otherwise has an exciting mix of quickness, size and instincts that make him close to a prototypical point guard. His strengths give him a fairly safe floor, but that shot could hamper him as a scorer. He’s a serious handful on both sides of the floor, and in a class with fewer great point guards might have been talked about as a top five pick. A pass-first player with crazy physical attributes, the Belgian rounds out this top group of point guards. He’s one of the youngest players in the class and has tasted high-level European play already. He won MVP at the U18 championships, where he had 31 in the title game and hit 17 of 29 threes over the course of the tourney (which should assuage at least some concerns over the jumper). Ntilikina’s a stud, and if he played college basketball this season, the hype would be substantial. Don’t be shocked if someone picks him higher than this. 7'0″, 225 | forward | fr. As a seven-footer with a pure stroke from three, you can watch a Wildcats game and decide Markkanen’s an NBA player faster than you can say “pace and space.” He’s the kind of talent that can help alter the geometry of an offense at the four or five. His inconsistency as a rebounder and lack of shot-blocking production in college raises questions, though. It’s hard to stay on the court as a big these days if you can’t protect the rim, and when you think about the expanded demands the NBA will place on Markkanen, it’s clear he’s a longer-term project in that regard. 6'11″, 222 | forward | FR. The range of draft outcomes for Giles is predictably wide, as it’s still hard to peg exactly what he is right now. He looks healthier, for one, and his high school dominance is still fresh in people’s minds when considering the risk-reward situation here. Giles, of course, was the presumptive No. 1 pick for a while before multiple knee injuries clouded the picture. He’s hardly playing in a crowded Duke rotation (which seems to be working right now), so barring changes, his draft status may be more dependent on workouts and medicals. While his athleticism may not return to what it was, his well-rounded skill set still counts for something. 6'10″, 215 | forward | SOPH. Rabb’s decision to return to school may not wind up affecting his draft range much. He’s having a terrific season, averaging 14 and 10 and has reinforced his strengths as a rebounder and shown a solid face-up jumper. If he can stretch that out to the three-point line, it could do wonders long-term. He’ll be a more polished player when he comes out and could become a productive starting big for someone. There’s still plenty to like. Soon to return from overseas, Ferguson’s deep shooting ability as a traditional two-guard sets him apart in a relatively thin positional crop. He’s long, bouncy and should be able to defend on the wing, profiling as a useful piece that most teams can use. The questions some scouts have are tied to a lack of productivity in Australia, which to some degree is understandable after skipping college. There’ll be added emphasis on strong workouts. But his three-point stroke should translate, and there’s upside here once his body fills out. 6'9″, 237 | f/c | FR. 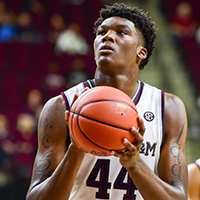 With perhaps the most tools of the draft’s toolsy prospects, Williams is super-long (7’4” wingspan), super-bouncy and super-raw. He’s a long-term project with lottery-level potential as an energy big and shot-blocker that has teams intrigued. The ceiling here on his athletic ability alone is extremely high, and he’s displayed some comfort hitting jumpers, to boot. 6'11″, 240 | forward | fr. Leaf is all offense, but he’s very good at what he does, able to score at all three levels, from the block, facing up and from three. He’s a good leaper and can play above the rim, makes plays as a passer, and looks like a versatile cog perfect for the modern, uptempo game. The defensive questions are fair, but he’s got the key elements you want in a stretch four. 6'8″, 215 | forward | SOPH. An unfortunate knee injury ended Anunoby’s season, but shouldn’t drop him out of the first round if he decides to come out anyway. His plus-plus potential as a multi-positional defender keeps his value pretty high as long as the medicals check out. Anunoby displayed a decent three-point shot to pair with his elite athleticism, and has enough going for him that he shouldn’t fall far. Hope the injury isn’t too serious. 6'6″, 226 | forward | fr. A lot of the Bridges hype stems from his freakish physical tools—he’s an explosive dunker and instinctive rebounder, and has been able to compensate for a lack of positional size at the college level. The question is how much those shortcomings will affect him in the pros. He’s a four-man in a shooting guard’s body. He can shoot a little bit and bully smaller defenders, but when you think about what his NBA matchups might be, there’s reason for skepticism. He’ll have a place in the league with his versatility. After a strong series of performances at FIBA U18s, Hartenstein solidified himself as a first-round player and has a pretty interesting skill set for his size, able to score inside and out, rebound, defend and make plays. He’s a little bit of a wild card and can be inconsistent, but 15-25 feels like the right range. 6'9″, 205 | forward | soph. Lydon’s big breakout season coming off a Final Four run didn’t totally materialize, but his numbers are up across the board (50% from the field, 42% from three). He’s fairly well-rounded offensively, should be able to play both forward spots and can do more than just space the floor. He’s also an underrated athlete, although his body could use some work. Lydon’s consistency remains a bit of a question. 6'10″, 225 | FORWARD | soph. One of the ACC’s most dominant players and biggest surprises, Collins has taken a big-time leap as a sophomore. He rebounds extremely well and has shot 60% on for a so-so team in college basketball’s toughest conference. 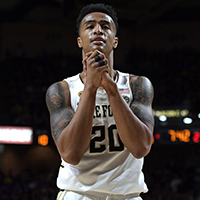 Collins has strung together eight 20-point performances and counting, and his efficiency has put him squarely on the first-round radar. He’s not a finished product, but might be worth a swing here. 7'0″, 230 | F/C | fr. Backing up Przemek Karnowski has limited Collins’s playing time a little bit, but his flashes have been really—surprisingly—promising right away. 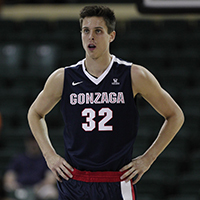 He’s scored efficiently both inside and out for the undefeated Zags. Collins’s per-40 numbers are just one way to look at this, but they’re insane (24.6 points, 13.4 rebounds, 3.4 blocks), although remember Gonzaga definitely isn’t playing, say, an ACC schedule. He’s athletic, versatile, and looks like a great fit for the NBA game. He could stay another year, but doesn’t have to. 6'11″, 224 | Center | Fr. Allen has started to put some strong production together in the second half of the season, but still leaves something to be desired in terms of feel. He’s got size and length that will get him picked but needs seasoning, and it wouldn’t hurt if he came back for another year and works on his offensive game in particular. A 22-point, 19-rebound game against Kansas turned heads, and his draft status will benefit from a lack of true centers in this class. 6'10″, 230 | center | fr. Another guy who’s purely a project right now, Anigbogu has had a ton of interesting moments this season. He’s benefited some from easy buckets in the UCLA offense. He doesn’t have much of a skill set offensively, but his length, massive hands and willingness to bang down low offer a lot for the imagination. Defensively, his upside is as high as basically any big in the class. He could stay in school as well, and won’t turn 19 until October. 6'10″, 250 | FORWARD | fr. 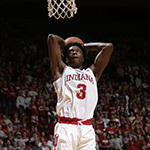 While Adebayo’s not having a bad year for UK by any means, some of his limitations have been on display. He’s very good at the things he likes to do: dunking, jumping running the floor, etc. 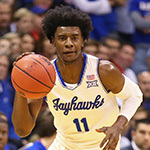 But he’s limited offensively otherwise, and though he’s got an NBA-ready build, he’s a little smaller than you’d like for a guy with a skill set like his and his feel is a little behind. He passes the eye test, but the more you dig in, the more he looks bound for a more limited role. He’s essentially a poor man’s Tristan Thompson. 6'6″, 202 | guard | soph. Kennard has been the NCAA’s most efficient scorer on a points per possession basis, which is a really, really impressive thing to factor in when you look at his breakout season. People are going to knock him as an athlete, but he does so many things well with and without the ball in his hands that it’s easy to envision him helping somebody out, some way. He’s tough, can handle it, and is one of the best shooters in this draft. 6'10″, 241 | center | soph. Although Bryant’s star has dimmed somewhat during an up-and-down year for both he and the Hoosiers, you have to appreciate how hard he plays in addition to his massive frame. He’s active on the glass, but his numbers don’t really match the eye test there. Bryant has blocked more shots this year and shown a more comfortable-looking jumper, too. His lack of elite lift and quickness limits his ceiling, but you can see him slotting into a role off someone’s bench and making an impact. If he ends up falling out of the first round, he could be a nice value pick. 6'10″, 240 | center | fr. Bradley’s no-frills game has fit in nicely on a deep Tar Heels team, and he’s a strong rebounder with length, good feet and hands and improving post instincts. He’s just solid, and rounds out a really intriguing group of bigs slotted in this late first/early second round range. He lacks an elite calling card, but does enough well and has shown plenty to get himself picked if he comes out. 6'6″, 204 | guard | sr. This is going to be one of those picks that you shouldn’t overthink. Hart’s well-rounded game, strong feel and elite efficiency should make him well worth a look around here, particularly for perennially successful teams looking to round out their rotation. He’s a terrific college player and his strengths should translate into an NBA role. Look at what Malcolm Brogdon’s doing as a rookie for the Bucks. 6'4″, 185 | guard | jr.
Not to throw back-to-back Bucks backcourt comparisons out here, but if you’re wondering how Allen fits at the NBA level, think about Matthew Dellavedova’s role with Milwaukee and previously with the Cavs. All the narratives about tripping aside, Allen’s a tough, tough kid, good athlete and capable shooter who should be able to defend both guard spots and bring grit to a rotation. You want guys with his makeup on your side. Multiple scouts I talked to liked Allen 25–30 in last year’s draft, and it’s looking like where he might wind up again.